The ICB Public Sector Accounting teaches you about the accounting method that is used in central and local governments, as well as other non-profit public sector entities. When you complete these courses you will be well equipped to become a public sector accountant. The public sector refers to all the public services and public enterprises in a specific economy. It includes all institutions run by the government. It’s all the parts that make up the local, provincial, and national governments. This goes across many institutions, such as different government departments, non-profit organisations, state owned companies, and even municipalities. What Does a Public Sector Accountant Do? The public sector accountant ensures that the finances of the government is run smoothly. They review the financial documents of the government and the taxpayers. Their work ranges from the auditing of tax accounts as well as investigating government agencies’ financial accounts for possible fraudulent activity. The reason for specialising in this is because the aims of public sector accounting differs from accounting practices in the private sector. Public sector accountants are monitored by The International Public Sector Accounting Standards Board, known also by the acronym of IPSASB. IPSASB is responsible for developing the standards in accounting for entities in the public sector worldwide. What are the ICB Public Sector Accounting Courses? This is a 12 month course and serves as the entry-level course for the programme. The entrance requirements for this course is Grade 11 or an NQF 3 qualification. You don’t need any accounting knowledge to do this course. This is also a 12 month course that serves as the intermediate course for the Public Sector Accounting course programme. The entrance requirement for this course is the National Certificate: Public Sector Accounting. The last and final course in the Public Sector Accounting programme. It is also 12 months in length and serves as the advanced-level course. 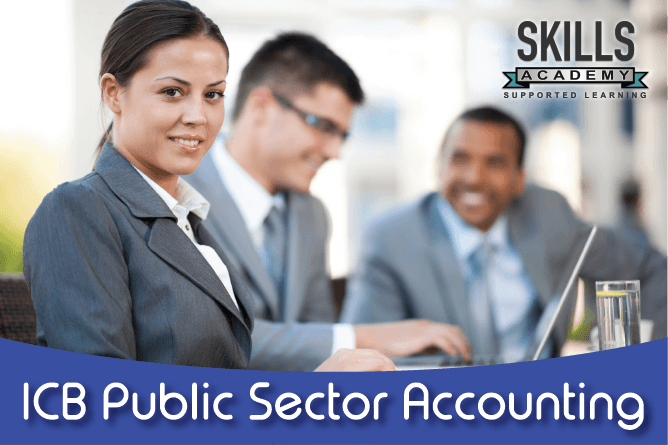 The entrance requirement for this course is the Diploma: Public Sector Accounting. Why Study ICB Public Sector Accounting? This is the perfect course and ICB qualification to study if you wish to one day be a public sector accountant. Studying through the ICB offers many doors for you, as it’s accredited, internationally recognised, and offers opportunities of professional memberships. Here at Skills Academy we do everything in our power to ensure that you achieve success in your studies, even if it is distance learning. When signing up with Skills Academy, you are automatically signed up in a study group with other students that study the same course and subjects as you, along with a course expert. We also provide support via telephone, email, and WhatsApp. We go the extra mile to help you do the best that you can. To register for an ICB course, you first have to sign up and register with your chosen training provider. After that you can register at the ICB on their Learner Portal. To start your journey to a better future, fill in the form on this page for a free callback, or call us toll free at 0800 39 00 27.